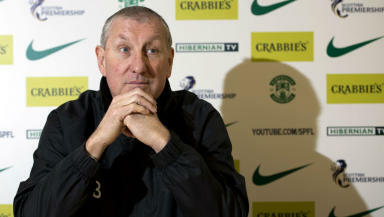 The Easter Road boss had a deal thwarted by injury but is close to adding to his squad. Terry Butcher is not letting transfer window frustration get to him, after a deal to bring a player was scuppered by injury this week. The Hibernian boss had been tracking the mystery target for weeks, only for the player to pick up an injury in training just as a deal was close to be being sealed. However Butcher is still hopeful that he will add to his squad soon, and could even bring in a new face before Sunday’s Easter Road showdown with league leaders Celtic. He said: “We made movements on a couple of players. It’s amazing when you go through the whole process and then get there and the player is injured. “He’s injured himself in training so we need to move on to Plan B, then Plan C.
“We are still working very hard and we will see. I can’t promise anything at the moment. Hibs had an interest in new Aberdeen striker Adam Rooney, but could only offer a loan rather than the permanent transfer he has sealed at Pirttodrie. Butcher claims reports unfairly painted him as bring beaten the signature but he said the club never got as far as offering terms to the striker. He said: “With Adam Rooney, we never made an offer to him that he could reject as has been widely broadcast. “Adam was going to Aberdeen on a permanent deal and we could only offer a loan deal and him and his agent weren’t interested in that. “Everyone’s agents are contacting players and saying ‘Hibs are in for this player’ and ‘Hibs are pipped at the post’ when it has never been the case. “There’s a lot of untruths in the press about who we have been after.